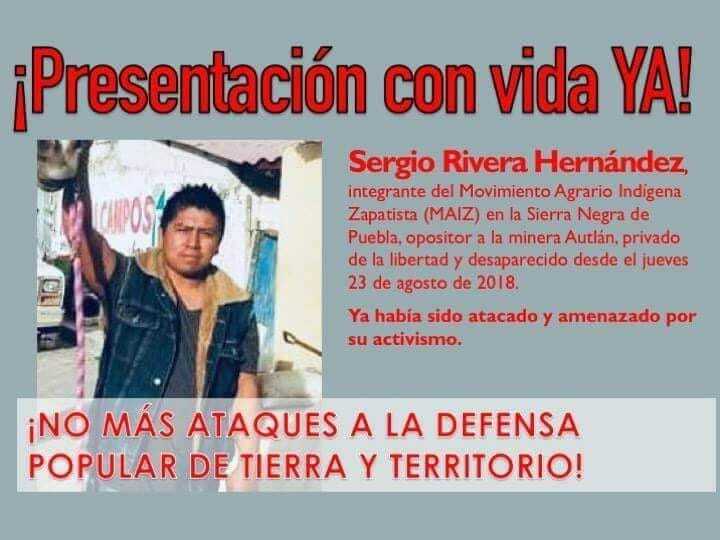 International alert: Indigenous activist who campaigns against hydroelectric dam has gone missing in Puebla state, central Mexico – Serapaz A.C.
Sergio Rivera Hernández, Indigenous activist and member of Movimiento Agrario Indígena Zapatista (MAIZ) and Comisión de Derechos Humanos y Laborales del Valle de Tehuacán, is missing since 23 August at about 6pm. He took his motorbike and left his community, Coyolapa, for Tepexilotla, about 20 minutes away. He said he was going to make some photocopies and would return to Coyolapa. At about 7pm neighbours saw a white pick-up truck camper speeding on the road from Tepexilotla. No other cars were seen in that period. Moments later another neighbour who had just returned from Tepexilotla told locals that he had seen Sergio’s motorbike lying by the side of the road and some sheets of paper scattered around, but Sergio was not there. A group of Sergio’s friends went to look for him. They have been looking for him in the area since then, to no avail. Federal authorities have been alerted but there are no signs of effective search yet. Sergio Rivera and many members of Coyolapa and neighbouring communities have been campaigning since 2016 against the construction of the “Coyolapa-Atzatlán hydroelectric system” (Sistemá hidroeléctrico Coyolapa-Atzatlán) which would consist of two dams. The system has been proposed by the Mexican company Minera Autlán and it would benefit a mine that the company runs in northern Puebla. The hydroelectric dams have been authorized by the Mexican government but construction is yet to start. On 29 June, Sergio Rivera was brutally beaten by four local men with links to the mayor of Zoquitlán municipality, where Coyolapa is. The men told him it was because of his opposition to the hydroelectric dams. Days before he had received a death threat in a voice message over Whatsapp. A relative of the Zoquitlán mayor told him “Pray to God that the PRD does not lose. I will make sure something happens to you, I know people in Coyolapa.” In Zoquitlán, the PRD mayor, who supports the hydroelectric dam, lost the election to the MORENA candidate, who is against it. Sergio Rivera campaigned for MORENA at the 1 July election. The attack was reported to the Puebla state prosecutor’s office but no investigation has been carried out. Sergio Rivera gave names and surnames of the assailants to the authorities. On 9 February, the bus which a number of activists had just used to return to the community after a advocacy trip to Mexico City was burned down by armed, masked men. The drivers, who were the only people onboard at the time, were ordered to get off at gun point. No one was hurt. Sergio Rivera, as most of his colleagues and neighbours, is of Indigenous Náhua origin. They have opposed the hydroelectric dam on environmental and cultural grounds. Please take action. Urge the Mexican government to carry out an effective and immediate search, establish his whereabouts and, if he has been a victim of crime, bring all those responsible to account. Also, urge the Mexican government to carry out a full investigation into previous attacks.